Too easy to make—thick bacon wrapped around jumbo shrimp. Preheat grill or oven broiler. Clean shrimp, then wrap them in bacon and secure with a toothpick; set aside. Combine all ingredients for the sauce in a small saucepan. Bring to a boil and then reduce to medium heat. Reduce the sauce by half or until it has thickened. 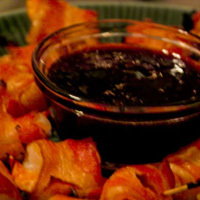 You can use the sauce as a glaze or as a dipping sauce. Grill or broil shrimp until bacon crisps and shrimp is firm.